Build really cool Lego robots, and then control them with your tablet? Yes, please. Lego Boost ($160 on Amazon) is aimed at kids ages 7 to 12, so I was a little worried that it would be too hard to enjoy with my son—he’s 5 (and a half!) and just started kindergarten. But while I had to direct the complicated builds, controlling the finished robots and vehicles with the iPad app was well within his grasp—and so much fun for both of us. Lego Boost teaches kids in two ways: The builds themselves are a lesson in mechanics, showing how the motor, gears, and pieces fit together to make a moving robot. Plus, the tablet app is full of programming challenges to direct the robot to do what you want him to do. One Lego Boost kit lets you make five robots, one at a time. That’s because the “brains” of each robot is the Move Hub, a little box covered in Lego bricks. It contains the batteries (you’ll need 6 AAAs), the Bluetooth chip that communicates with your tablet (iPad, Android, or Fire), and a friendly green power button. The Move Hub also has a couple of ports, where you connect wires from two other special Lego pieces. One is a motor, and can turn wheels, control arms and legs, and so on. The other is a sensor that can be used for input—you can program the robot to react when he sees or hears something. First you’ll build Vernie the Robot, following step-by-step with instructions in the app. The first phase, building the robot’s body and head, took me about 40 minutes. Then you get to use the iPad to turn him on and have him say hi before you plunge into next phase, building his wheels. I like how the app breaks things up a little like this, because the complex builds took me a while, even working alone and moving quickly. Once Vernie’s body, wheels, and arms were finished, my son and his buddies loved using the iPad to have him move around. Everything he can do is represented as a little puzzle piece in a toolbar along the bottom. Kids can drag pieces into the programming area, string them together, and then press Play to have the robot act out each step. Lego Boost also comes with a play mat you can use to help you design your programs. The mat is divided into a grid, so when you program a movable robot to go forward once, it moves one space on the grid. That way, kids can decide where they want the robot to go, and then count how many times it needs to go forward and where it should turn. My son and two other 5-year-olds had no problem figuring this out, and needed very little help from me once the robot was actually built. 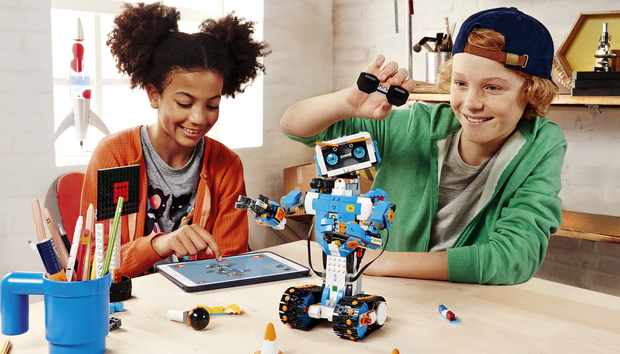 Since it's designed for kids 7–12, Lego Boost should be easier to grasp than Lego Mindstorms, which is for kids 10 and up and uses more complicated programming methods. Next you’ll build Frankie the Cat, Guitar4000, a construction machine called the AutoBuilder, and the bulldozer-like M.T.R.4. Each of them winds up being cute as well as relatively tough. They broke if the kids were extra rough with them, but they also survived a lot of bumps and crashes that I thought would do more damage. The whole set is full of Lego’s high quality. The Move Hub pairs automatically with Bluetooth 4 whenever you turn it on, so kids don’t have to know how to set up a Bluetooth device. The robots and the app’s design appeal to all kids (and adults, to be honest), regardless of gender. Kids don’t even need to know how to read. Lego Boost has tons of replayability, too. 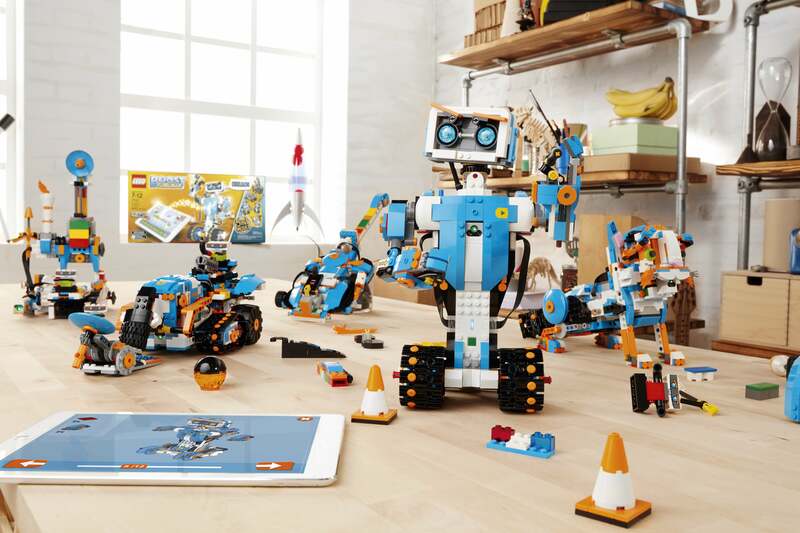 The app has more than 60 challenges spread across the five robots, and since these are just Lego bricks, kids can tweak the robot designs, stick their own minifigs onto them, or build other Lego creations for the robots to interact with. I didn’t mind letting my son and his pals play with it for long stretches of time, and they really seem to enjoy it. From left to right, you'll build the AutoBuilder, which actually constructs small LEGO figures; move stuff around with the bulldozer-like M.T.R.4; play songs on Guitar4000; program Vernie the Robot; and cuddle up with Frankie the Cat. Oh, one little thing: The robots make sounds, but those all come out of the app, so be sure to keep your tablet's speakers up. Also, programs that use audio input (in other words, the robot has to hear your voice before it’ll move) also use the microphone on the tablet, not on the robot himself. Honestly, I don’t think my son noticed, but your kids might. The biggest challenges are accessing the Move Hub when you eventually need to change the batteries, and keeping the Lego Boost bricks separate from the rest of your Lego collection, because you’ll need them all to build the other robots. But if you keep your bricks pretty organized anyway, maybe you’d still be able to find the pieces you need. Following along with the iPad instructions isn’t too difficult, even though the builds themselves are pretty complicated, and you can always page through the instructions once to find all the pieces needed, and then again to actually assemble the robot. “It’s very cool and people should actually buy it,” my son just told me in his most serious voice when I asked for his verdict. Frankly, I have to agree. At $160, it isn’t cheap, but it’s got more educational value and just as much play possibility as a regular Lego set.